"I'm sorry. We may be Facebook friends but I really feel it's a breach of etiquette to ask me for money when I don't believe you've interacted with me at all online. Have you shared my posts? Conversed with me? Supported me in any way? Would you walk up to a stranger at a cocktail party and utter a request for money before even introducing yourself?" I wrote this in response to a private, direct request that I support this Facebook friend in his project. This is a person who has not once commented on anything I've posted, not shared a link from me or by me, not interacted at all with me. And yet, he feels it's okay to privately and directly ask me for money. You might be surprised to learn that I got pushback. "Well I'm not actually asking for money.." In fact the initial communication WAS a request for money, lots of it. Because he really believes in his pet project and offers me the opportunity to support him. And $700 was only one of the suggested donation levels. And it was not a program for the greater social good. I'm used to donor-fatigue as a concept. When I've worked with non profit agencies that are supporting programs that fill in the gap between community needs and public programs, these conversations come up. I'm talking about things like Big Sister Association. But these days it seems everyone with a keyboard or mobile device believes they are entitled to have their dreams funded by the public. Just because there now exist ways to "kickstart" your projects by asking the world for money, does not give you license to act like an ill-mannered boor. A final note about crowd-funding. Please be professional. Some of us have been around the block a few times and we've worked very hard to develop business plans. Some of those have succeeded or failed but when we've done the work, you can understand how it irks us that you have not and yet you still feel entitled to have our financial support for your dream? If you think guinea pigs need socks, show me some data. Show me you've done your homework. Tell me who your competition is and how you're different. Demonstrate your skills and experience that will make your booties rock harder than others'. Then, and only then, should you ask the public for money. As is often the case, there are real world parallels (not that the Internet is not real world) that I think are instructive. I don't think these are new rules, really, just old rules applied to new forums. Don't ask for money before you have taken the time to introduce yourself. Just because YOU believe in your dream to knit booties for guinea pigs*, does not entitle you to asking for financial support from the world. And they are not obligated to share your dream, to supply you with funds for yarn, or to spread the word on your behalf to support your quest of clothing cold rodent feet. * full disclosure, this is not a guinea pig in socks. To my astonishment, I could not find an image of one. 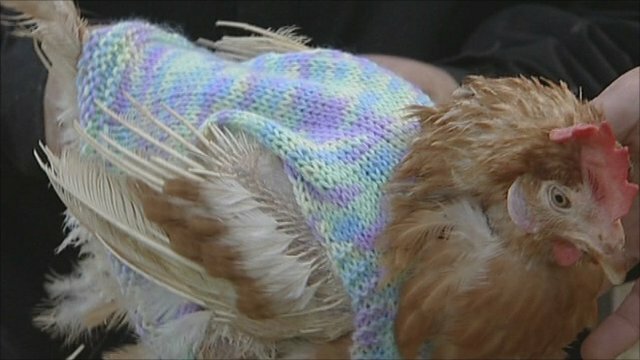 This is a chicken in a sweater. This I could not make up. 2. Make a connection between new friends and old. If you've started following me because you like something I have to say about knitting, introduce me to another knitter you like. That's an easy "give" that costs you nothing. 3. If you see me posting about my latest knitwear creation, share it with your community. Sharing is caring. We all want to grow our online communities. It's a nice way to show me you care - before you hit me up for a favor or a donation. 4. Check in before you check in. If we're meeting over coffee to discuss our new yarn discoveries, don't tag or update with my name until you ask me. Perhaps I begged off another meeting without saying I was going for coffee, or maybe I'm taking a midday break but a client might think I'm goofing off (even if I worked through the night) - just ask first. 5. Hello? Introduce yourself properly on the phone. To paraphrase the wonderful Lily Tomlin, be sure it is the party to whom you are speaking before you speak. 6. Connect in public, schedule in private. While it's fine and good to connect online, when it comes to actually nailing down the time and place to meet, you should revert to email or direct, private messaging. I wouldn't schedule drinks with friend A right in front of friend B without inviting B. It's rude. Same applies online, no need to make anyone else aware that super fantastic fun plans are being made and they are not invited. Also not necessary to alert the world when you will be not at home. 7. When you meet someone IRL (in real life) or face to face, introduce yourself in a way that let's them know who you are. 8. When we meet in person, be there. Don't spend the time I've carved out to spend with you, on your phone. If you'd rather be tweeting, it's no big thing, I've got lots to do, too. But if we made time to be together, let's really be together. I will often say "I'm just going to update my status because this is a place people have been asking me about, is it okay if I check in with you then I'll put the phone down?" 9. Tag - you're it! It - being the insensitive clod. Don't be that guy. Ask before you post a photo and tag someone in it. Also, if you don't like a photo someone posted of you, just ask them privately to take it down. They should do so w/o protest. 10. DON'T SHOUT, don't spam, don't cc. These seem to be so old and common sense that I almost didn't include them here but you might be surprised that others still don't know this. ALL CAPS is the same as SHOUTING in person. Why are you SHOUTING at me? Spam includes endless chain letter appeals on Facebook (Most are scams by unsavory mills that boost their page views and sell their numbers to advertisers. You're only helping them.) As well as the email types. And why do some PR professionals still send out emails w/o using bcc? You get only one of those mistakes then you're toast. What are your top Internet Pet Peeves? What have I missed? How do you feel about asking for RT? I don't think it's as offensive as asking for money or liking your own picture on Instagram, but it should be used sparingly, like when you're promoting an event. 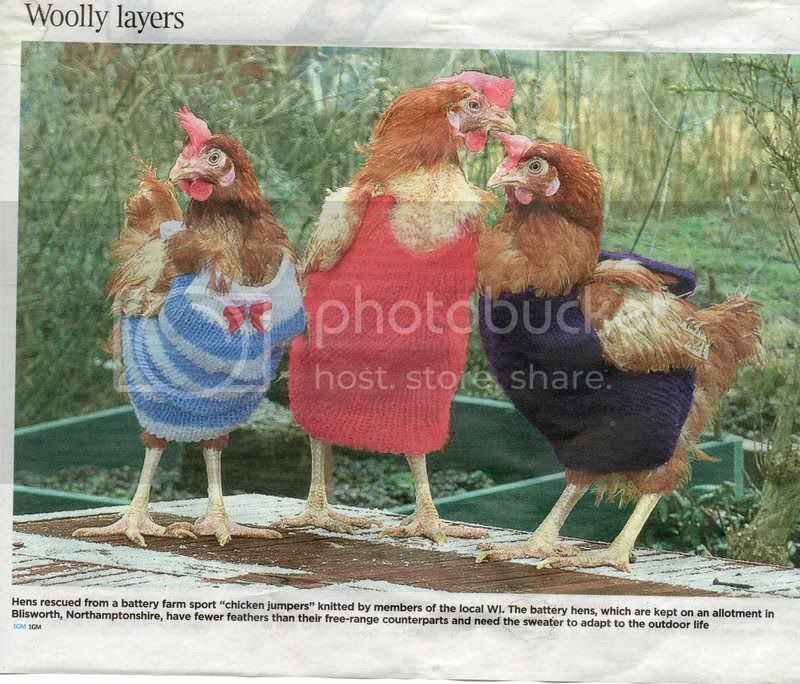 Hurrah for rescued chickens and for the ladies who knit to keep them warm!